It’s difficult to find fault in any way with Aladdin and, as a fan, I say it is about time Disney released it again for everyone to enjoy. It's hard to imagine that Aladdin came out 25 years ago. I can't believe I'm actually that old!!! Alas, it's true, and to celebrate the 25th Anniversary of the movie, Disney is releasing it on Blu-ray this month. The long awaited Diamond edition set will surely be embraced by so many who know and love the film, and are eager to share it with a new generation of Disney fans. For the unacquainted, Aladdin (Scott Weigner, Full House) is a poor street rat, stealing food and living in squalor but yearning for more. When he is offered the opportunity to earn great wealth he jumps at the chance only to find himself buried alive in a desert cave. Of course, like all good Arabian stories, he finds a magic lap with a genie (Robin Williams, Mrs. Doubtfire) who grants him 3 wishes. True to the Disney brand, Aladdin ends up saving the day, getting the girl and having his every desire fulfilled. A fanciful tale of love, hope and redemption, Aladdin is a terrific twist on a classic that includes a spectacular cast highlighted by the enormous talent that was Williams. His Genie will forever be beloved and unrivaled. He is one of the many things that make Aladdin so special, along with an animated magic carpet, an adorable, yet sassy, pet monkey, and numerous catchy songs that stand the test of time. I was surprised at how well the video transfer held up, marveling in the technology that allowed the hues and shadings to be so vibrant. The reds, oranges and yellows were bright and warm, while the deep blues and blacks portrayed an evil that enhanced the danger of some scenes. The DTS High Definition 7.1 audio was fantastic and really allowed the audience to appreciate the full orchestration of the score. For those who love extras, this Blu-ray set doesn't disappoint. There are hours of features, including Genie outtakes showcasing the unrivaled genius of Williams. The tribute is truly touching and heartbreaking all at once. The look at the making of the Broadway show was interesting and educational, and made me want to buy a ticket for a future performance. Also included, are the extras from the original DVD release presented in 4 by 3 aspect ratio, preserving the authenticity. These features include over an hour of discussions with the producers, writers, animators and cast, and unreleased songs that didn't make it into the final film. 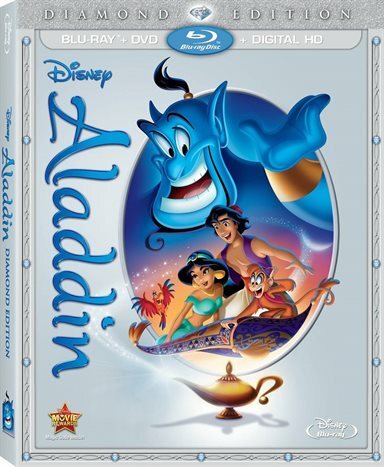 Aladdin is a Disney classic with a winning formula that calculated out to profits when it was originally released. I have no doubt that Gen X-ers, like myself, will gladly fork over their hard earned dollars for the nostalgia of a fabulous cartoon with an amazing talent tragically lost forever. For more information about Aladdin visit the FlickDirect Movie Database.